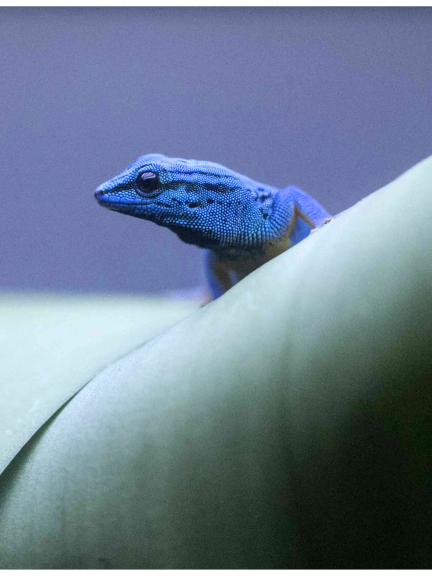 The electric blue day gecko (Lygodactylus williamsi) is only found in one tiny area of East Africa. It comes from the Kimboza forest, in Tanzania, where its range is an area of around 3 square miles (8 km²). The species is classed as Critically Endangered. This dazzling gecko's survival is threatened by illegal collection for the international pet trade and the destruction of its tropical forest habitat. The population is thought to be declining rapidly. One study suggests that between December 2004 and July 2009 up to 42,000 geckos were taken by just one collecting group. That could be 15% of the wild population. In the wild, turquoise day geckos live exclusively on the screwpine, Pandanus rabaiensis, mostly in the leaf crown. They eat small insects and nectar and drink water from leaves. Collectors commonly cut down these trees – which are themselves endangered - to reach the geckos, destroying both habitat and the gecko population. In addition, many geckos are thought to die while being shipped to market; the pet trade could be a worse threat than habitat loss. Meanwhile, remaining forest areas are seriously threatened by farming, illegal logging and mining. This is a new species for Paignton Zoo, though very similar to the phelsuma day geckos the charity has successfully bred for years. These geckos came to Paignton from Sparsholt College in Hampshire. There are five pairs and two additional males; they are thought to be among the only individuals of their kind in the UK. These diurnal geckos vary in length from about 6 to10 centimetres. The male is a bright turquoise blue, the female is a shimmering olive green. Both are bright orange underneath and live for up to 10 years. There are plans for a Europe-wide conservation strategy. Paignton Zoo Environmental Park is a registered charity. For more information go to www.paigntonzoo.org.uk or ring 01803 697500.